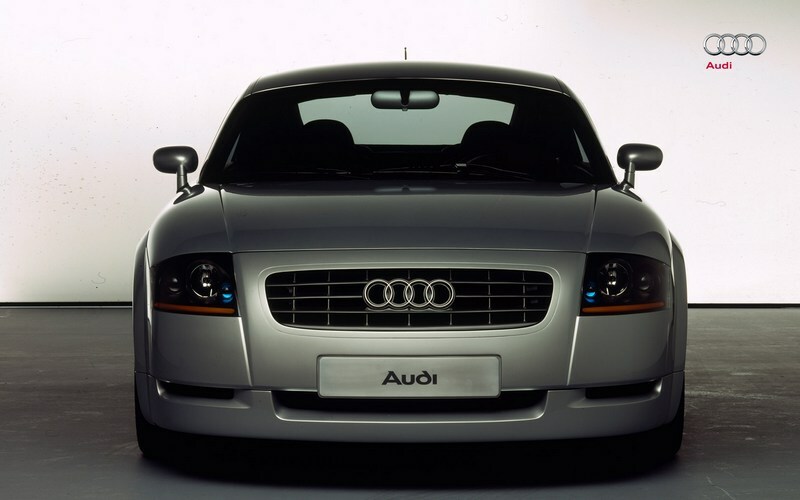 "An enthusiasts' car with great charisma," was the way Audi's chairman, Dr. Herbert Demel, described the coupe" design study presented at the 1995 Frankfurt International Motor Show. 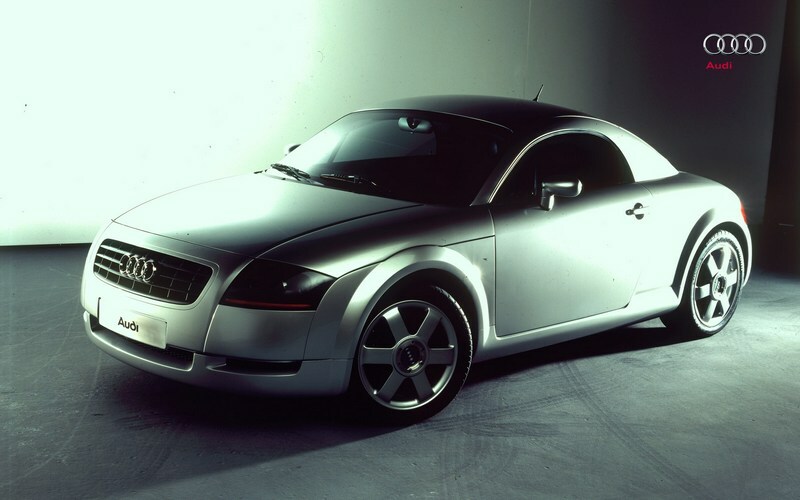 The Audi TT Coupé has an unusual development history behind it. It was produced by a team of young designers and engineers whose vision was to design a 2+2-seater which would be pleasure itself to drive: a car which would appeal to both the head and the heart. The aim was to create an "object of desire" of the kind normally only seen in the form of the old classics - but an attainable car, not just something to dream of. Existing production technology was borrowed for the power train and chassis; five valves per cylinder, turbocharging and four-wheel drive inspire the driver's enthusiasm. Aluminium for the engine bonnet, the two doors, the rear lid and the front wings reduces weight. The car's exterior contours are of the German school of design, with 1930s automobile design cues and the rounded curves of the Auto-Union pre-war racing cars and post-war saloons. The fundamental principle for the car's interior was: as much as necessary and as little as possible. Afterwards, nobody could say with any certainty who thought of it, or how or when. It was one of those things simply destined to happen. And, indeed, it did - an Audi with several proud fathers. The resulting car could hardly conceal its parentage even in a poor light. It's a car that tempts you to leap in and drive away without the slightest hesitation. A car with looks that are bound to have the dictionary open at quite new pages: a "hit", a "star" or a "winner" simply aren't evocative enough. The top performers among us, the aesthetes, the eco-freaks, those for whom nostalgia never fails to work - it will appeal to them all. 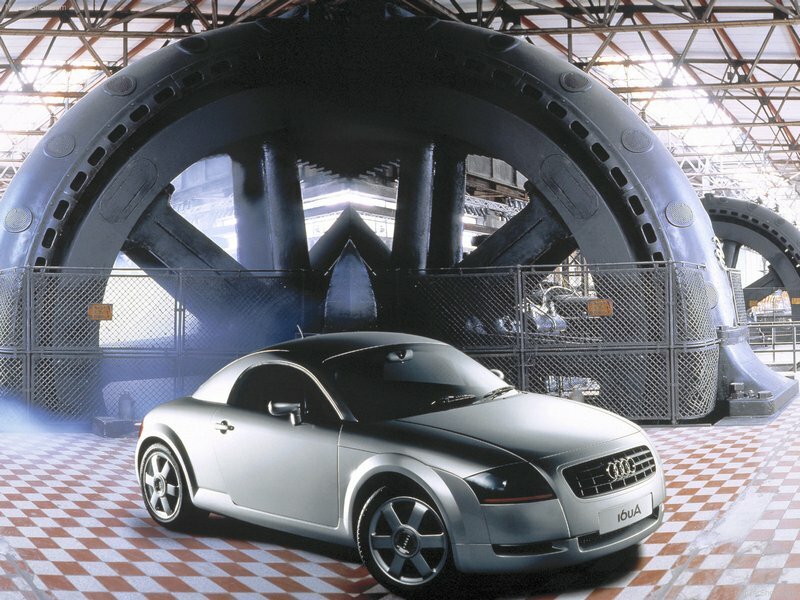 This is Audi's new "TT" Coupé just four metres long, with a high- tech power unit developing 110 Kilowatts. Audi has conceived this new 2+2-seater as an unmistakable essay in a classic sports-car area, as the essence of dynamism and driving pleasure. The origins of this car tell a tale as unusual and stimulating as its appearance. The decisive moves in the game were made on that slippery slope where the success or failure of new products is always decided - where the stylists and the engineers conduct their sometimes uneasy alliances. What does the highly respected French designer Philippe Starck have to say about the significance of his profession? "People buy designer articles as if they were waving a flag with the name of their social caste emblazoned on it!" Aber die Designer sind selbst höllisch zerstritten über die Art, wie sie ihr Geschäft betreiben. Einer von ihnen hat gar 99,9 Prozent seiner Kollegen als "Deppen" tituliert. Designers themselves have totally failed to agree on the nature of their activities. One of them even described 99.9 percent of his colleagues as "half-wits". Such mutual accolades come easily to the representatives of a profession surrounded by a certain aura of the inexplicable, where "feeling" and instinct has a major part to play. Have women of all age-groups suddenly taken to wearing brutal leather walking boots? Is there a new craze among the men for haircuts in the style of the US Marines? Designers' studios analyse all these trends in case they provide a clue as to clients' wishes in the future. But clear signs from the intending customer are something of a rarity, with the result that the designers take over. On their eternal wanderings in the no-man's land between art and craft, they contribute their own tastes in a most helpful way when they sense the direction in which the customer's sub-conscious mind is moving. It's hard to put a foot wrong in a trade that even boasts "scent designers" with a strong feeling for what the client likes to smell. 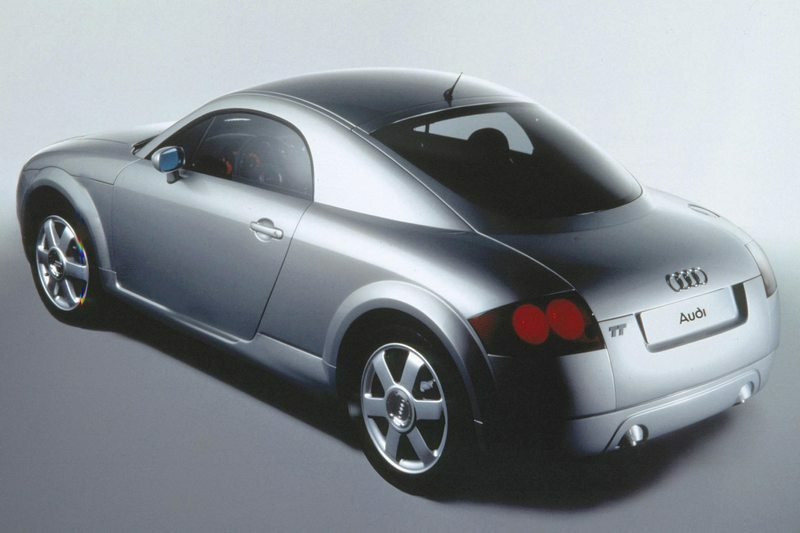 The Audi TT Coupé was spared this agonising gestation period. With hindsight, it almost seems as if its designers and engineers had allowed their imagination the same free rein as the passionate Pininfarina in his day, and that company management had obligingly closed its eyes to such direct methods of achieving results. 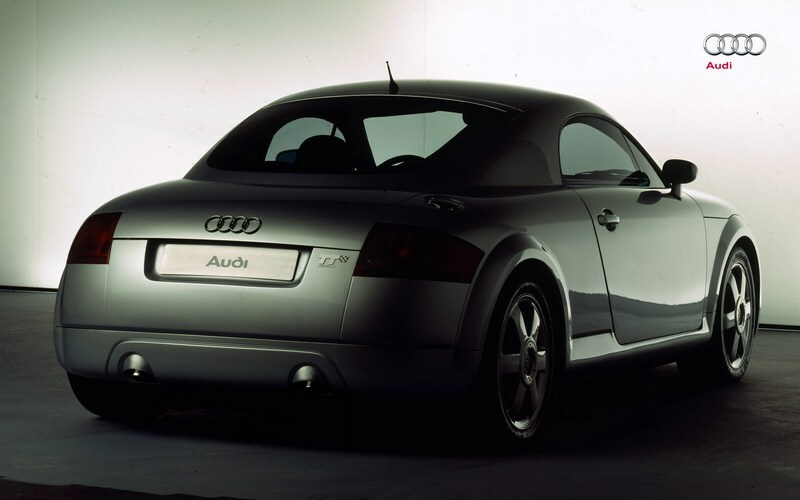 The TT Coupé's creators had a vision - a vision of the Audi brand. They wished to reach the hearts as well as the minds of today's car-freaks. In no time at all they had become a group of conspirators, dedicated to building a car that would turn heads, that one might even permit to overtake in order to see it from all angles, but not a car so elite in character that only a chosen few could afford it. A car with "character", of a kind nowadays only to be found in fading photos of historic classics in specialist car magazines. The idea took shape, the pencils scurried to and fro across many a draughtsman's pad and soon there were sketches of sufficient substance for the Audi board of management to be graciously permitted a quick glance at them; a gleam, it may be said, appeared at once in the board's collective eye. There was no carefully tailored marketing concept, no cool assessment of chances and risks - none of the precautions that normally precede the development of an initial prototype. Conspirators, even those with the best of intentions like our determined group of designers and engineers, don't behave that way. Even the relative seclusion of the Audi Design Studio was not secure enough for them. Somewhere down on the bank of the River Danube, outside Ingolstadt, the "Audi City", they set to work "with unbelievable enthusiasm" (an insider's words) and finalised the basic concept within a week. The prototype then took a mere seven months more to materialise. The developers' work was made easier by being able to dip into the high-volume Audi models' parts bin for the driveline and running-gear components they needed. In this way, they circumvented the constraints of the "performance specification", the document which not only lays down the technical data, dimensions and tolerance limits for all the car's parts but also specifies their production costs. 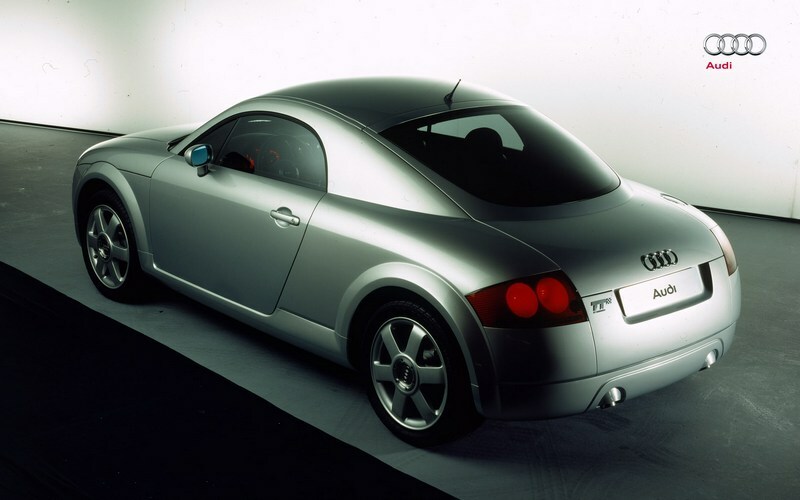 The Audi TT Coupé makes use, in modified form, of the technical features of an Audi model which has not yet been launched. This will guarantee it the same high standard of technical perfection that all Audi cars are renowned for. Five valves per cylinder and four-wheel drive, as • the engineers so convincingly assure us, are intended to produce "a sense of delight and driving pleasure" right up to the new car's projected top speed of 225 km/h (139 mile/h). 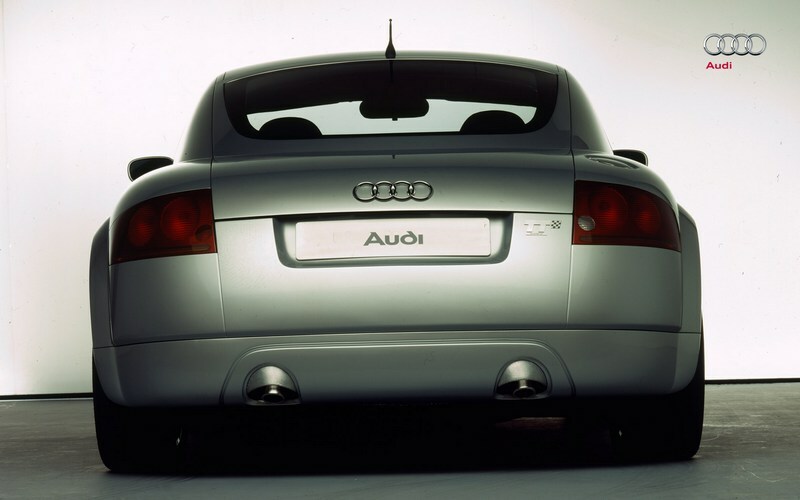 The source of all this performance is to be the 1.8-litre engine from the Audi A4, installed transversely on this occasion and, as we have said, with five valves per cylinder. Its output and pulling power are higher than comparable engines, but the reverse is true of its exhaust emissions and fuel consumption — under 8.5 litres per 100 kilometres (33.2 Imp. mile/gal) for the average of the three standard European consumption test values. This combination of performance and frugality will, the engineers hope, earn the respect of even the most dedicated ecological campaigner. Adopting the Audi aluminium construction concept in modified form was another step in the right direction: this weight-saving metal is used for the engine and luggage compartment lids, the doors and various interior elements. Allowing the Audi team out on a long leash seems to have resulted in its designing precisely the car its members would clearly love to own! Identifiable emotional influences are motor vehicles from the nineteen-thirties, the clear, systematic outlines of the "Bauhaus" and the elegant curves of pre-war racing cars and the Auto-Union's post-war saloons. The Fifties, too, are echoed, with a formal reference to the rounded bodies of German sports cars and the character attributed to them ("small", "modest" but "strictly functional" too, "fast" and "manoeuvrable"). As the final ingredients, a dash of the compact, fulminant NSU TT and a helping of the down-to-earth spirit of the original Rally quattro from the Seventies were added to the mix. This was the stuff of which dream sports-cars are made, with the kind of clear outlines and almost purist styling that makes the Anglo-American driver's heart in particular beat faster. The interior too is sporting, functional and above all with nothing superfluous added. The instruments are circular, with bold markings; the roll hoop is exposed, whereas the two airbags are present and correct although concealed from view. The radio, as a secondary function, is logically hidden from inquisitive eyes behind an aluminium panel when not needed. The use of aluminium for many details, and also of leather, absolves this interior from any suggestion of spartan character. An interesting design detail: two aluminium hoops support the centre console at left and right, with the double function of "knee guide" and "grab handle". Aluminium appears once again at the handbrake lever, the semi-circular cover on the centre tunnel, the rings used to rotate the ventilation outlets and the switch surrounds and gear lever gate; exposed rivets are used to secure all these items, as on an aircraft body. Where to put the spare wheel? Some members of the team wanted a temporary wheel inside the luggage compartment, where it would have occupied only a small amount of space. Their more nostalgic colleagues pleaded instead for the spare wheel to be mounted where it could be seen through the tailgate window, in the spirit of English sports cars of the Fifties. Perhaps not altogether unsurprisingly, Audi has identified men who are also car enthusiasts as its prime target group for the TT Coupé 70 percent of the men in this category are below the age of 39. They respect performance in every area and like to demonstrate this with the cars they choose. They are the legitimate inheritors of the group previously apostrophised as the "pipe-smokers", whose characteristics allegedly include the patience to endure various forms of martyrdom, particularly those associated with rapid travel in firmly-sprung sports cars. Clearly, such heroes still exist today, but they are less willing than before to suffer without reason, although they none the less appreciate the occasional reluctant if admiring gaze and the evident respect of other motorists. Audi goes a stage further, and would like the modern, confident woman to conquer a share of this "man's car" too - there are women enough today to whom driving pleasure is not an unknown concept.